single cut-out: 5 3/4 x 5 1/2 x 3/4 in. single cut-out: 4 1/2 x 4 1/8 x 3/4 in. single cut-out: 5 3/4 x 6 x 3/4 in. Kara Walker presents us with jet-black stainless-steel silhouettes that embody the complexity of racial identity, gender roles, and racial violence. 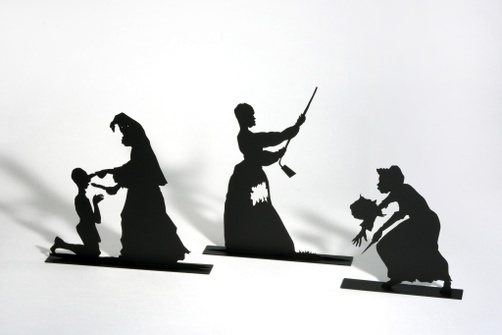 Drawing inspiration from the antebellum South with specific references to slavery and racism, these cut-out silhouettes depict characters from Germanic fairytales with modification intended to embody common racial stereotypes. This approach is consistent with Walker’s other work that addresses historically racist perspectives in the South. The three figures in this piece are titled The Bush, Skinny, and De-boning, and each is shown with an object such as a weapon or Klan hood known to be used as tools/signifiers of violence; by including these objects, Walker links historic injustices to contemporary racisms.